To Sum It Up: Jena and her four sisters look forward to every Full Moon, when they’re able to cross over into the Other Kingdom, where they dance among fairies and other magical creatures. The sisters may not be able to journey to the Other Kingdom for much longer, however, when their sick father must leave them to regain his health elsewhere, and their cousin, who blames the inhabitants of the wildwood for a childhood tragedy, starts curtailing the girls’ freedom. It’s up to Jena to find a way to stop her cousin from controlling her and her sisters’ lives, as well as from destroying the wildwood. 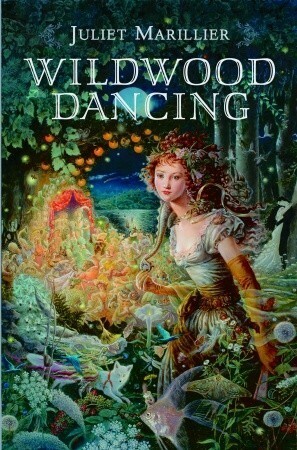 Review: I first borrowed Juliet Marillier’s Wildwood Dancing from the library over a year ago but sadly did not have time to read it before it was due back. It’s taken me this long to pick it up again, and this is yet another case of Why Didn’t I Read This Book Sooner?! Sometimes you just have to take a moment or two to admire how pretty a novel’s prose is, and there were several such moments while reading Wildwood Dancing. Almost immediately, you’re whisked away into a realm of fairies and other magical folk. The characters from Dancing Glade, and even Dancing Glade itself, brim with so much life. It’s easy to understand why the protagonist, Jena, and her four sisters love their trips to the Other Kingdom at every Full Moon. With the novel set in Romania, Marillier also incorporates vampires into the story. They’re called Night People here, and they’re as chill-inducing and dangerous as they are alluring. Jena is a great main character, fiercely protective of her sisters and the core of the quintet. Each sister has a distinct personality, but it’s Jena they look to as “the sensible one.” And how could you not be intrigued by a protagonist with a pet frog whom only she can hear talk? Jena and Gogu’s bond was a highlight of the book for me, not to mention Gogu’s snarky side, which might have gotten him into a tad of trouble if everyone were able to hear him. My only slight issue with Wildwood Dancing was the pacing. A few times I felt like I’d made considerable progress reading for the night, but in reality, I hadn’t read as many pages as I’d thought. I never lost interest or found myself skimming, but a confrontation or two less between Jena and her bully of a cousin, Cezar (it’s been a while since I met a character so desperately deserving of a punch to the face) would have been fine. More often than not, fairytale romances miss their mark with me, but I absolutely fell for this one. It suited this story perfectly, and I unabashedly loved it. 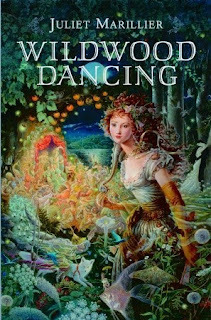 There’s quite a bit to love about Wildwood Dancing in addition to the romance, and I will definitely be reading more of Juliet Marillier’s novels. All in All: I really do regret not reading this sooner. The fantasy aspect is so well done—it’s as though you’re there with Jena, Tati, Paula, Iulia, and Stela in the Other Kingdom. This is very much recommended if you enjoy reading fairytale-type fantasy. I think you would really like this one- the world-building is stellar. I wasn't that far into the book before I completely understood why Juliet Marillier is such a revered fantasy writer.